My truest joy, at Christmas and throughout the year, is held in the presence of my Savior. I am completely blown away by the grace and mercy that began in the gift of Christ and continues every day as I walk – held fast by His love. I cannot wrap my mind around a love so pure and so strong that it has redeemed nations. It has set the captive free. It has marked time and history- and has marked my heart and soul. As I reflect on the birth of Christ, I look at the story in Luke from a different angle today. I have, in recent years as a mother, looked from Mary’s perspective. What about the others, though? Only Mary gets to be Mary. Only Mary saw Jesus as her baby boy. It isn’t bad to look through that lens, but we aren’t Mary. I keep going back to Zechariah, as he is filled with the Holy Spirit and testifies to the covenant of the Lord after John is born as he says, “Praise be to the Lord, the God of Israel, because he has come to his people and redeemed them. He has raised up a horn of salvation for us in the house of his servant David –as he said through his holy prophets of long ago- salvation from our enemies and from the hand of all who hate us, to show mercy to our ancestors and to remember his holy covenant, the oath he swore to our father Abraham; to rescue us from the hand of our enemies and to enable us to serve him without fear in holiness and righteousness before him all our days” Luke 2:68-75. Remembering the promises of the Lord through scripture, re-telling the stories of His faithfulness, continuing to encourage and instruct our children in the Word is our honor and our privilege. As a child, I would sit in a crowded living room with what seemed like a million family members and listen to the Christmas story from Luke 2. Christmas at my Grandparents’ house was the most anticipated day of the year. It wasn’t because of presents, even then. I adore my family. My grandparents are my heroes. I am passionate about my Savior. What could be better than all those things together at once?! It was a beautiful and perfect time. This is the first year without my Grandparents. There is an emptiness around Christmas that aches to the core of my being—and a realization that the responsibility is ours now. We will continue to teach the truth of Christ and the love of family and the importance of being together. Mix all of the above ingredients in a large bowl until combined well, transfer to an air tight container for storage. When you’re ready for a cup of cocoa, put 1/3 cup of the mix in a mug and add ¾ Cup boiling water, top with marshmallows and stir. Start by placing sugar, corn syrup, salt and ½ Cup water in the sauce pan and turn to medium heat. Cover and let it cook for 4 minutes. Uncover and stir just enough to let the ingredients grow to love one another. Clip a candy thermometer to the side, not touching the bottom of the pan, and let the temperature get to 240F –about 8 minutes. While that’s cooking up, put the three packages of gelatin powder in the bowl of your stand mixer, add the other ½ Cup of water, and wait for the sugar mixture to be ready. As soon as the candy thermometer reads 240F, pull the lovely, syrupy goodness off the heat. Turn the mixer on the lowest setting and slowly pour the hot syrup in to the gelatin that has been so patiently waiting. When you have emptied the sauce pan in to the mixing bowl, turn the speed up to high and set a timer for 15 minutes. Lightly spray your metal 9×13 dish with non-stick spray and dust it with a few tablespoons of the powdered sugar/cornstarch blend you have prepared. When the timer goes off, add 1 teaspoon of vanilla extract and let it mix for one more minute. Spray a rubber spatula with non-stick spray and ease the marshmallow crème out of the mixing bowl, into the 9×13 pan. *if you have a reason to use marshmallow crème, keep some out at this point, it is fabulous. Let that rest uncovered for 4 hours or overnight. Dust with a few more tablespoons of the powdered sugar mixture and cut up to the size and shape of your liking with a pizza cutter or cookie cutter. 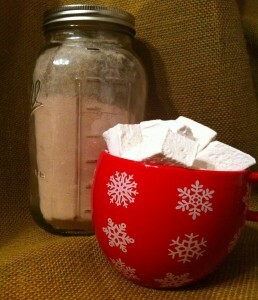 Transfer the newly cut marshmallows to a separate container and dust with, yes, more powdered sugar. They are sticky little suckers if you don’t! You can store these for a few weeks in an air-tight container.